The final part in this blog series of over aroused dogs, is looking at the physical aspects and causes. There are two main areas of physicality that can affect over arousal, either creating it or affecting it. Those broad areas are physical health, and physical stimulation. Each can be further divided into sub-sections including hormonal changes, chemical imbalances, ill health, injury or lack of physical stimulation, inappropriate physical stimulation, lack of strength/fatigue/fitness etc. Dogs that are easily over aroused, can often be a result of an underlying physical issue that is causing a level of discomfort or anxiety, which then subsequently results in their behaviour changing. This could be a underlying health issue, that is affecting their behaviour. It is not un-common for dogs that have sudden and random behaviour changes, specifically aggression, to have a thyroid issue. This is often difficult to identify at first, but can often be an indicator of over arousal. There has been more recent studies that have shown the importance of a healthy digestive system, and specifically the gut and stomach. A very close friend and student, had a border collie who as classic of a dog that lived and engaged in a over aroused state, and a lot of his tension would be linked to his gut health. When he was young he started to suffer from allergies and had to have a specific diet to help maintain his health, and would often have stomach cramps and self induced hunger strikes because of it. The signs were initially sporadic and random. His behaviour would change unpredictability. You would see a noticeable change in his state of arousal, when his allergies were proving challenging. This took extensive investigation to able to reach a series of dietary adjustments, immunotherapies and general management to ensure he was ‘feeling good’ and not being anxious and extra ‘hot’ in his work. It was very much a one step forward, two back…. it was emotional and challenging, seeing him clearly uncomfortable and anxious. It was because of his owners relentless dedication that his health issues were resolved and he ultimately became an Obedience Champion, and more importantly, lived a long and happy life till 15yrs old. He had management of his health throughout but was able to be ‘happy’. Those from a horse background will be able to affirm the need to pay close attention to your charges diet, and adjust accordingly to the temperament of the animal. The same can be said of dogs. Being aware of how much protein or red meats your dog is having, can also have an affect of their behaviour. 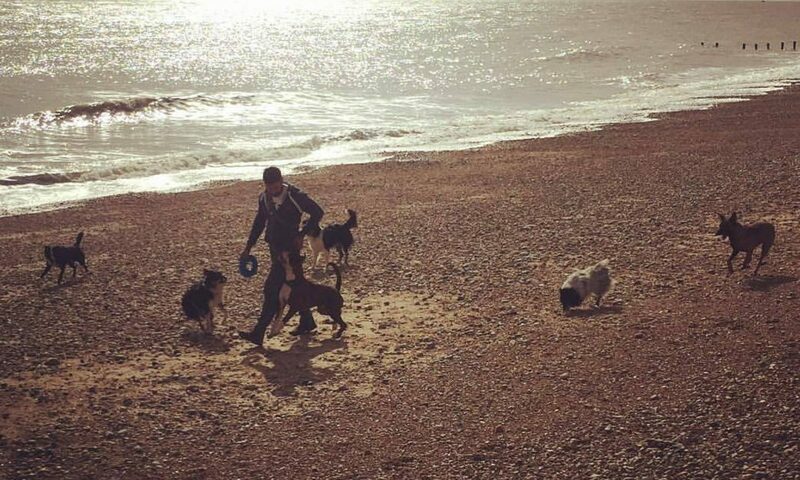 Whilst, I am not a nutritionalist, I know with my own dogs over the years, that I will make adjustments to their food and supplements depending on their activity levels and temperament. Coat quality, reddened eyes, muscle tone and general appearance can all be indicators or your dogs well being, and over arousal will affect the cortical levels which will have an impact of their well being, both physically and mentally. However subtle behavioural changes, over arousal, eating habits, anxiety, tension, aggression etc could also be symptoms. Physical stimulation is a crucial part of creating a dog that isn’t constantly over aroused. Sometimes it’s as simple as having an insufficient outlet for their abundance of energy. I talked about the malinois in the previous blog in this series. There is a breed that has a lust for physical stimulation. My first malinois could easily do a 6mile bike ride, maintaining trot throughout and still have energy to train afterwards! He LOVED it! He would go into what I can only describe as a mediative state. I always explain that exercise to my dogs that are of a type, likely to show over aroused tendency’s, perceive exercise as a drug. I equate it to insulin for a diabetic. It needs to be consistent, it needs to be appropriate and it needs to be diverse. I can only assume that they get addicted to the chemicals released as a result of physical exercise. However, creating an ‘adrenaline junkie’ is also a typical trait of dogs who are over aroused. Repetitive exercise or behaviours can create exactly that. How often do you see people using ball launchers to exercise their dogs, paying no attention to the physical and mental ramifications? I appreciate their popularity and convenience, but a closer look would actually prove very enlightening. A good hard sprint is excellent, it blows off the cobwebs and expels energy… but this needs to be balanced out with more sedate, casual activity. Paying attention to the physical aspects, subtle signs, behaviour changes can often give a indication as to why your dog is over aroused. 1. Regular exercise, varied, diverse and challenging. This can be a series of hill sprints, or a mooch in the woods. One of my greatest pleasure is finding new interesting locations for my dogs to investigate, its like watching kids in Disney land… pure joy! They are literally getting a feel good chemical release! You can see it in their every being. 2. Provide an outlet for who the dog is. These dogs tend to be intense and obsessive. So provide an outlet for that part of who they are, but additionally create ways to stimulate them that isn’t always go, go, go! Nosework is excellent for doing just this. As is trick training and problem solving games. Get creative. 3. Regular check ups with health care practitioners as a preventive measure, means that you aren’t allowing physical issues to develop and become a potential problem. Prevention is often better then cure. 4. Diet and behaviour are closely linked. The phrase ‘you are what you eat’ springs to mind…. if you see changes or issues of over arousal, start to keep a journal of diet and see if there are any patterns. 5. Behavioural changes are like clues to a mystery ‘what caused it’, you may have to put on your deer stalker and get out your magnifying glass… the clues will lead to a solution. The clues can be often be subtle. The prize is your dogs well being and mental health. Its worth the investigation! 6. If you time is limited and you can take your dog out for an extensive walk or run, its ok…. the odd day off won’t hurt! Although physical stimulation is crucial, everyone likes a ‘do nothing’ day to slob… PJ’s on, good movie and a duvet! Unwinding is as important. 7. Believe it or not, lack of fitness can create over arousal. If mentally you REALLY want to do something, but your body won’t let you… imagine the frustration you’d feel? This can create an association with the environment, or situation which then becomes the trigger for that stress. Being able to complete a behaviour, with physical ease, will equate to confidence and clarity. 8. Dogs that are ‘over triers’ or easily over aroused, will often have no comprehension of pain. You have to be sensible for them, and observe if their anxiety and over arousal is masking pain and discomfort. 9. Creative ways to feed are a useful tool in dealing with dogs that get over aroused. Kongs, snuffle mats, frozen, hunting and searching games are all ways to feed in and around environments that may be challenging. This creates a association that is conducive to calmer behaviour. 10. Taking baseline stats is a great way to monitor physical changes which may be linked to issues of over arousal. Posture, movement, weight, muscle size are all crucial data to note. Having them logged can help when behaviour changes. Keep posted for following up ‘surprise’ this weekend! The genetic influence to over arousal can prove a complex conversation. It can be personal, it can be historic, it can be emotive and it can be enlightening. There are some breeds, types or lines within breeds that are predisposed to ‘over arousal’, and beware aware of this can help minimise this becoming a huge issue. The following could be applied to many dogs and breeds. However for the purpose of explanation, I will focus on one. Lets look at a breed that I hold near and dear to examine ‘over arousal’ caused by genetics and selection based on traits deemed desirable. The malinois is the ultimate and extreme end of the canine world that ‘suffers’ from over arousal. I use the term ‘suffer’, but in truth it also makes them so amazing. Their characteristics are both a blessing and a curse. Malinois’s by nature are a dog that ‘live on their nerve’, meaning they are hyper-vigilant, easily aroused and have extreme reactions, swinging from one end of the spectrum to the other, in a split second and then being perfectly ‘fine’ the next. All traits, that when not channelled, utilised and educated can become problematic. They are a breed who come ‘over aroused’ from birth largely! If you ever see or meet a litter of malinois puppies, they are notoriously intense even in their early interactions. It is not unusual for malinois puppies to want to bite and show ‘aggressive’ behaviour more akin to older dogs. Their exteme intensity is often apparent early on. This can be displayed as aggression, apprehension or anxiety. Whilst it is much sought after to find and select a ‘calm stable’ malinois, they are somewhat a rarity now due to their popularity and prevalence in dog sports, and even rescues across the globe. Its a numbers game. As a breed increases in popularity, often so does the loss of core attributes. So why and how have we created a dog with these traits that we see in the malinois? A huge determining factor today, is the influence of dog sports, and the Malinois’s aptitude to undertake any dog sport with tenacity and verve. The malinois intensity, allows them to complete behaviours with speed, intensity and flare. All appealing in dog sports. The Dog/human relationship originally stemmed from harnessing natural behaviours or desires, into tasks or ‘jobs’, and then subsequently modified to sports specific tasks. So hunting, chasing and biting have been moulded into sports specific skills. Therefore any animal with ‘more’ of these attributes would be best suited to perform these behaviours. For example, the dog that loves to chase and ‘grab’, would be ‘easy’ to train to do bitework or agility. However, this desire can come in abundance and without an off switch. And what happens to the remainder of the time, when you aren’t using these traits? Unfortunately they don’t disappear. Additionally, this tenacity and drive makes them resilient, which is an attribute needed to endure the rigours, knocks, misinformation, lack of understanding etc that we have inadvertently imposed on dogs as a trade off with the human/canine dynamic. Dogs are amazing, and tolerant. Having resilience comes in handy. The dogs that had an aptitude to these behaviours or character traits, would be most ‘successful’ and then their genes perpetuated within a sport. So the cycle continues. To have a dog that is prone to over arousal, takes a great deal of understanding to be able to harness those attributes into a task and create a stable citizen. I regularly encounter clients who have taken on such a breed, or type and initially are allured by all their ‘assets’ until these grow and develop and become their undoing. This can result in rehoming, submitting to rescue or even PTS. Often their drive and intensity can appear dormant or non existent initially, but like a genie in a bottle… it is there waiting and itching to come out. I call these ‘slow burners’. My first malinois was off this type, I made the fatal mistake of thinking he ‘had no drive’…. I soon learnt that lesson! These type of dogs are most definitely for specialist, they can be fantastic ‘pets’ but need an outlet for those breed characteristics, and they need an outlet that is ‘healthy’. Often these types of dogs have an unhealthy obsessive compulsive mindset, which if not worked on can contribute to over arousal. But they are also ‘special’! 1. Ensure you find out exactly what you are taking on, warts and all. In dog sports specifically, it is easy to create an illusion of what a dog is, rather then what they truly are. See a dog/breed etc from all perspective and ensure you do your homework! Having to cope with a dog that is susceptible to over arousal in daily life, can be a all consuming commitment. Make sure you know what you’re taking on. 2. Dogs that are prone to over arousal, are generally a joy to train and engage with. That isn’t going to be the struggle. The challenge will be teaching them to ‘chill’, be ‘calm’ and switch off when needed. Place as much importance on this as teaching skills. 3. Teach a clear on and off switch. And be consistent with its use. This creates a dog that knows when it can be ‘off’ and not ‘ever ready’. This is crucial for creating ‘balance’. 4. Two positive make a negative. Putting two high energy dogs together doesn’t necessarily mean a good thing. More isn’t always better. You want to select dogs that compliment each other. What does your dog lack and what attributes would you like to improve. Be objective in your choices. No dog is perfect and thats ok.
5. Look at the sport beyond the sport. How does the cope with the challenges of the environment, test and situation. There lies the ‘real’ dog. A good trainer can make an average dog look amazing, or mask flaws. Don’t be afraid to ask questions. If you have nothing to hide, the answers won’t be an issue. 6. Ensure your dogs relationship to the work is healthy. A slight amount of obsession is a great asset, too much and it can be your ongoing. Balance out desire with indifference, and do it from day one. 7. Be mindful of awakening the genie too early, too soon or without any understanding. Once the genie is out, it won’t go back in the box! If it’s in the dog, let it come out with understanding, maturity and time. It isn’t a sprint to success, its a marathon. 8. These type of dogs crave ‘work’, but provided outlets where they can expel mental and physical energy is a important part of creating contentment. It doesn’t have to always be about ‘work’, some things in life are free! 9. Don’t ignore the details. These type of dogs have a knack of masking anxiety, nerve, apprehension, misunderstandings…. they just keep trying! The spectrum for behavioural traits are all over lapping, fear and aggression, excitement and anxiety….The dog that is over aroused, may be hiding something else. It can be their way of ‘coping’. Pay attention… seeing ‘over arousal’ for what it is, is crucial, to identifying a solution. 10. The pursuit of ‘calmness’ is a long term goal, for dogs that live on the edge. Trying to ‘force’ it will only add to their frustration. Contentment is fair easier to attain. Start there, and move to calmness. There is a epidemic sweeping across dogs sports globally and into the houses of innocent dog owners across the world. And that is over arousal…. More and more, I am being asked to consult on cases of dogs that are worryingly over aroused, be it in the context of dog sports or within a domestic setting. More and more I am seeing dogs that are living life in an unhealthy state of frenzy and hysteria that often manifests itself into problematic behaviour, either to others or themselves. This could be a issue with ring side management with your agility dog, or ‘reactive’ behaviour on a walk. There are several reasons why dogs are likely to be exhibiting such traits, and several ways to avoid this developing into an issue. It is also possible to improve this behaviour retrospectively, if proactive actions are taken. The causes can be put down to three key areas, and over the 3 days I shall elaborate on each one individually. Understanding is a broad and far reaching umbrella under which falls everything from training, and education to misconceptions and misinterpretations. Dogs that are over aroused can often lack understanding about how they are expected to behave and perform in environments that are potentially challenging, and this education must be proactive. A dogs ability to remain passive and calm by ringside in the presence of full flight activity, needs to take as much priority (if not more), as s skill needed for competition. It should be perceived as a area that needs to be trained as systematically as anything else that you want your dog to rehearse. This means patience, commitment and reinforcement. Creating distances away from anything that maycreate arousal is crucial to create opportunities to reinforce. The common misconception of what ‘drive’ is a huge contributing factor to why their is a mass of over stimulated and over aroused sports dogs. Drive (and for the purpose of this explanation, I am referring to the desire and motivating factors we harness and channel into our training), is often misunderstood. When I trained martial art, my teacher had a simple phrase that articulates what ‘true drive’ is. ‘Empty vessels make the most noise’. It is a common sight to see frenzied, hysterical behaviour exhibited in over aroused dogs, which is perceived as equating to more speed and better performance. Let me clear, I am not referring to a dog showing enthusiasm and interest, but rather when the response is extreme. However this type of over aroused state is one that is not only unhealthy, but counterproductive. If we look at the arousal curve, in relation to peak performance, we know that the optimum point is somewhere in the middle. The dog should be engaged, but able to ‘think’ and ultimately listen in that state. Is is very cultural in a lot of dog sports, to train and teach with a dog in a heightened state of arousal. Whilst is is smart training to engaged the dog prior to commencing, and build desire into each component part, it is a very traditional in certain sports to permit, allow or encourage over arousal. The fall out of this is far reaching. When dogs are in that heightened state or arousal, their cortisol levels are dangerously high, which can lead to health implications. Additionally, this can also lead to behaviour issues, such as re-directed aggression, stress related behaviours and much more. Not to mention, the stringent processes that people implement to deal with this over arousal. This can in itself, be stressful and further perpetuate the cycle of anxiety. We all have been are guilty of ‘sacrificing what we want, for what we want right now’s… Testing rather then training, or for convenience having our dog be in an environment that could be overwhelming or arousing because of wanting to participate. But does this serve YOU and YOUR end goal? Clear Criteria is crucial. Dogs operate best when they have black and white, rather then grey. Grey criteria will also lead to confusion and in highly driven dogs, then can appear as ‘arousal’. This applies to cues too. Giving clear information will reduce anxiety and therefore frenzied over arousal. Cultural influences. If the culture of your sport, that more is better? More speed, more aggression, more chase, more more more…. yes that can create dynamic responses and can even create the illusion of ‘confidence’, but ultimately who has to suffer the fall out when more becomes too much. Always be your dogs advocate and take ownership of your dogs learning and experience. Is this misconception that over arousal is drive? Think of a sheepdog trial… you rarely if ever see these dogs behaving in a way that is frenzied or hysterical. Their behaviour is quiet and ‘patient’, waiting to be called upon, and then ready to run at full speed up a steep hill. This is the true illustration of ‘drive’ working for you, rather then against you. Asking too much too soon, without enough reinforcement can also create ‘holes’ in your dogs understanding. Splitting vs lumping, will mean your dogs training is more likely to withstand the rigorous testing life and competition throws at them. Are you really sure your dog understands? If so write a cheque to say they do…. Still sure? Thats the level of confidence you want. Anything less, and you’re potentially contributing to the dogs over aroused state. Is your dog ‘keen’ or ‘anxious’? Is your dog worried or ‘being naughty’? Over arousal can appear to be a ‘good thing’ but is the dog really in an emotional state that is productive? Have you built confidence without the bells and whistles? Have you worked on indifference? Being able to conclude your dog is over aroused because of the stimulus, rather then anxiety, is a hard one to judge in the moment, so divide and conquer! Work on all aspects, to create confidence and clarity. Have you prepared yourself and your dog for stress and frustration? Do you feel anxious in that situation, when your dog is over aroused? Are you working on your confidence levels? Dogs that are over aroused because of an understanding issue, may be responding to your tension. Are you doing work on yourself? Your mind is like a muscle, to build it, you need to work at it and exercise it. Being able to think in a stressful situation creates a feeling of calmness, which leads to calmer behaviour. The same applies to your dog, frustration and stress tolerance is crucial for dogs being able to process information, but it needs to be done systematically and strategically. Take your time and incorporate elements of both to teach your dog how to function when either stressed or frustrated. Preparation is key. Your dog needs to understand there isn’t always a cookie and thats ok. Reinforcement can come in other ways and thats fine too. And sometimes there is no reinforcement, and its ok. If your dog needs to learn that behaviours don’t always receive reinforcement, as the instant they don’t receive one, they make get frustrated and ‘over aroused’. This is a necessary part of having a dog that truly understands. It isn’t BECAUSE of the cookie, it’s FOR the cookie. Have you taught your dog to think in an aroused state, and have you taught your dog to self regulate themselves? Shaping is an effective way to illustrate both concepts, and allow the dog to ‘figure’ stuff out and then increase the arousal, and see if they can repeat behaviours. Teaching your dog to get in a box, and decreasing its size, and adding excitement or increasing arousal are practical ways to ask your dog to combine the two things, thinking and arousal. And also allow them to learn how to self regulate. These 10 points could he expanded further, but are the key issues that affect over aroused dogs. Over the next 3 days, I shall share insight into other determining factors. Lights, Camera, ACTION! As we dawn the annual canine ‘Oscars’, Crufts is seen my the dog world as the pinnacle of the dog world. The glamour, glitz and glory! Held in high esteem, it is revered and feared in equal measures! For many, when they get their puppy/dog, they lay awake at night dreaming of stepping foot onto the hallowed Green. Just to have the honour, is perceived as mystical. Memories are made, dreams are realised and champions are crowned. As a competitor, coach, mentor, teacher and judge, I have seen Crufts from all angles and thought it would be a good time to put pen to paper, or in this case, fingertip to keyboard…. to offer some insight and advice. I can recall vividly, stumbling across ‘Crufts’ on the television, by sheer accident and being glued to it for the total time it was on. I can still remember the heartfelt disappointment, when I tuned in the following week to watch the ‘Coverage’ only to be bitterly disappointed it wasnt on! Little did I realise all that Crufts was. But a seed was sown. When I got my first ‘proper’ competition dog, I set about planning my route to ‘Crufts’. I trained morning, noon and night… my single mindedness and blinkered outlook, meant that I climbed the ladder of progression leading to that inevitable day, when all the hours, days, weeks, months and years of work all came together, and I found myself stepping foot onto the main ring at Crufts. An accumulation of a dream that started way before that moment, and one that seemed like Everest itself, to climb. But there I was, at the summit of the mountain looking back. Yet I was too overwhelmed and in awe of the occasion to truly absorb the moment. I was worrying about all that could go wrong, rather then focusing on what I had achieved. My first experience of Crufts, left me with mixed emotions, because I had spent years working toward something, that when I reached it, I actually didn’t enjoy. I was so wrapped up in nerves and anxiety, that I failed to see the glory that was in front of me. I missed the moment. It was a steep learning curve, and has subsequently allowed me to help so many others in all dogs sports, including Obedience, Agility, Working Trials, IPO, HWTM… to fulfil their dreams and master their mental game. I learnt the lessons needed to help others. On subsequent appearances, I took a moment to saviour the experience and relish my time on the Green, with a dog that I had a deep and intense bond with. A dog that had grown with me, and for me, that made dreams come true. It was this journey that truly taught me the importance of mental composure, being present and harnessing the power of your mind. I have also been being the scenes, as a coach/teacher and mentor, nurturing people from humble beginnings to top honours, from the dog that was thrown out of 3 clubs before I met them for reactive behaviour, who ultimately went on to win at Crufts… to being part of a history making international competition, flying a team from across the world to compete at Crufts, not once bit twice. Two different countries, two different stories. To those who I have seen raise and select their pup from birth, from a homebred litter to qualifying for the Obedience Championship. I have also been a judge, and assisting in various roles as an official, and seen the nerves up close and personal. All of these perspectives have given me a deeper understanding of the validity of a strong mental game, preparation, planning and delivering under pressure. Crufts is the ultimate test of all of these! It is the thing of legends, titles and tiaras. For many, it is a once in a lifetime opportunity. Or the possibility of greatness. Either way, having some simple yet effective pointers to steer you along can be just what you need, to execute that well rehearsed plan! Here are some tips to mentally help you be your best. Be present. This is easier said then done, when you are faced with a fire hose of emotions, all rushing towards you at once, but take a moment to stop and take in all the glory. This is the accumulation of those hours or training, dedication and commitment, this is what you have been working for, so enjoy! Game time, means game face. Get in the zone. Those moments before you compete, are your chance to gather your thoughts and centred yourself. This is your time to shine, so bring it! Don’t be afraid! Chest out, eyes bright and dazzle them! You’ve earned the right to do so! Trust your dog, trust your training and trust yourself. If you haven’t trained it, it is too late. There is no point worrying about it, let it go, and focus on what you can do. Because by doing so, you’ll realise you have so many weapons in your artillery! Stay in the moment, there is no point thinking of the second step if you haven’t got through the first. Just focus on whats in front of you, one thing at a time. Take time the night before to ensure you are packed and ready to go, this alleviates any last minutes stresses. Failing to prepare is preparing to fail! Remember cues, words and signals! Have cards to prompt you, or a friend to remind you. The dog will only do what you ask, so ensure you let them know! Take a time out for you. Go for a walk, go to the toilet, or go for a breath of fresh air. Take a moment to re-group if needed! For supporters, coaches, mentors.. The time directly after they have finished, is not the time to give a critique or feedback, good or bad. Pick your moment! Allow at least 15-30mins before you approach and discuss. Have fun! This is so crucial! This is a game we play, for our ego… with our friend/family that happens to have four legs, and fur! Don’t lose sight of that! I look forward to catching up with you all at Crufts, best of luck to all those competing, judging, stewarding or involved! Have a fantastic time! My book will be officially launched at Crufts, which details my journey in the world of dog sports! Great stories, tips and ideas from my perspective….. I shall be signing books on Sunday, 10th March at Hall 1 stand 70 Performancedog.co.uk, signing books.. time to be confirmed. Unfortunately due to Crufts restrictions, I wont be able to live stream or video the draw for the winners of the book give aways, however I shall post to my facebook page on the day! If you still want to win, a one of two, free signed copies of my book, ‘Pathway to Positivity’, go to my facebook page and share the video! See you at Crufts, and may the best dog win! Either way, you still take them home! Picasso was a world renowned artist, his legacy being his distinctive style and unique talent. Pavlov, the mind that identified the phenomenon of classical conditioning, and underpins everything that we do, our behaviour and actions. One an ‘artist’, one a ‘scientist’. Both brilliant, both genius. Both revolutionary. But it would appear that in dog training, there is a distinct divide between the ‘science’ of training vs the artistry of training. Like most things, be in raw feeding vs kibble, or vaccinations vs no vaccinations… there is almost a tribal mentality to both banners. Yet the irony is, neither is entirely right or entirely wrong. As a professional dog trainer, and someone who deals with behavioural issues, the ‘science’ offers me a blue print from which to ‘cheat’ the ‘solution to a problem’, yet the artistry allows me to ‘go off the beaten track’ and try something totally different. There have been countless times, when I have discarded what I ‘should do’, and allowed instinct and ‘feel’ to take over. And there have been countless time, when a well thought out, strategic plan, and identifying the patterns of behaviour and reinforcement, have provided a solution. If we look at both Picasso and Pavlov they both understood the necessity and importance of being a ‘scientist’ and an ‘artist’. Pavlov’s observations connecting his dogs salivating, was ‘an accident’ and his findings shaped so many walks of life. He knew not to ignore this ‘off the beaten track’ moment. Picasso’s unorthodox style and unique perspective, was a result of not being afraid to go against the current. He wasn’t afraid to be uninhibited. In so many ways fear, steers our decision making process. Its fear that causes so many to defend their beliefs and ‘tried and tested’ ideologies, and decree those that differ. We see this in all walks of life, but when we strip it back to its core, its fear that is at work. In dog training, behaviour and all matters related to canine well being, we see these distinct ‘tribes’, those avidly adhere to science and data, stringently recording data and analysing the outcome, and those that ‘paint’ and draw using instinct, trial, error and ‘feel’. The irony is that both approaches have more in common then we realise and the key it to embrace both ‘personas’. Whilst I regularly video my training sessions, and make mental notes on what I see, I am mindful of not over analysing to the point of self deprecation. Science gives us the lines to follow, the dots to join, and the colours to use…. artistry tells us when to mix them, go outside the lines and sign our individuality over the piece. A good trainer will have a sound understanding of the methodology, awareness of mechanical skills and impeccable training. A Great trainer will make it look effortless, as though they are reacting entirely on a deep connection between them and the subject. There are artists, there are scientists. We need both. Dogs need both. As a professional dog trainer and sports dog coach, I regularly have dogs in for residential training, that have ingrained behavioural issues. When I take a dog for residential training it is a way to ‘jump start’ the progression of the dogs training, whether it be for simply domestic training or more complex behavioural problems. A regular ‘type’ of dog that I am often asked to help, are those with aggression or reactivity issues. At present, I have one such dog, in my care. Tizer is an 18month old Border collie cross. I suspect some sort of setter based on his appearance and behaviour. I have actually known Tizer since he was approximately 16wks, as he was owned by a student. He attended one of my competitive groups, intermittently and I saw him less then a handful of times. It was apparent he was a sweet genuine little dog, with a sensitive streak. He showed great promise for Competitive Obedience, where you could see his extravagant movement influenced by the gundog in him. Unfortunately, his owner was unable to attend the group and time surpassed and I didnt see Tizer for well over a year. Recently, I got a phone call saying that Tizer’s owner was in need of help. His owner rang me, and I could instantly hear the sadness and heartbreak in her voice. She had a change of personal circumstances, and needed to find Tizer a home. She said that he had developed some major behaviour issues, including aggression and in-house fighting. She also said that she was concerned over his reaction to children and small dogs, to the extent where she believed that he would kill a small dog. There was no way that I could not try and help, given the situation. Here was a dog and person in need, and I was in a position to assist. The sadness part of this tale, is that this situation is neither unique or unusual. I count myself fortunate to have had more then my fair share of ‘guardian angels’, always there when I needed them, so this was the least I could do. On collection of Tizer, you could clearly see a heart broken owner and a ‘broken’ dog. He was edgy and apprehensive. When I collected him, there were children coming from a local leisure facility, and Tizer’s body language showed apprehension, fear and a tenseness. He was obviously uncomfortable around them, and even tried to lunge forward towards one that was closer to him. His behaviour was concerning to say the least. This wasn’t going to be a simple solution. I assured his owner I would do my best, and said I would contact her the following day, to discuss Tizer. She was clearly too emotional to do so at the time. Tizer had transformed from the dog that I initially met, who was sensitive and shy, but in no way aggressive. My role was to try and work out what had caused this drastic change in personality. When I spoke to Tizer’s owner, she said that he had been absolutely fine until he hit approximately 6months old. She said that his behaviour changed dramatically and declined. She said that he started to act aggressively towards her other dogs, in particular her male Australian shepherd cross. There had been 3 incidents, in which one Tizer caused damage to the other dog. In addition, Tizer received an injury to his eye area. She stated that this behaviour was often unprovoked and ‘random’. She explained that Tizer’s reactivity had increased from there, with outbursts towards other dogs on walks and also showing aggression towards smaller animals. The change of dynamics in the house, had caused tension and undoubtedly stress for both the owner and Tizer. As a a dog trainer and someone who deals with behavioural issues, I have to put on my Detectives hat, to try and work out why and how a problem has evolved. Whilst this is not always possible to fathom, it can help me work through the issue, faster. For example if a dog is lunging out at other dogs, being able to work out if it is fear based because it has been attacked by a certain colour of dog, I know that this is something I need to be aware of and can implement a plan accordingly. This information is helpful, but failing to have this insight, doesnt mean that the dogs behaviour cannot be improved, or even resolved. We just deal with the ‘now’. There were several ‘clues’ which may indicate why Tizer’s behaviour has become so extreme. Firstly, when I first met Tizer, he was definitely a sensitive soul. He was very biddable and receptive to training but would def need building up in confidence. He was very friendly with people, but would be submissive on approach. His behaviour was slightly appeasing, when meeting people. His demeanour was gentle but had an anxiety about his being. Dogs of this type, can often form unhealthy attachments to ‘their people’, and can result in anxiety related issues. My goal for all my dogs, is to create them being confident in their own being, with or without me present. If I have a dog of this ‘type’, I implement tactics to build their confidence up without my influence. His owner stated that his behaviour changed at approximately 6months, which would also correlate to adolescence when dogs behaviour can change. With male dogs in particular, there is change in testosterone levels, which can incite aggression behaviour, either the dog being the recipient of, or attacker. Often this is superficial, but can result in a level of trauma to the owner or dog. She also stated that he was very ‘attached’ to her, which could result in either resource guarding or separation anxiety. Because of Tizer’s sensitive nature, he would be more inclined to hold any anxiety and stress he felt, which would increase his likelihood of reactivity. When discussing Tizer’s behaviour, she said that the attacks on her other dogs, could be when all the dogs were in ‘quietly laying in the living room’. She stated that he would fly out at another dog without any warning. The incidents within the home with Tizer, would create an apprehension within the environment a dog should ideally feel a sense of calm and ‘peace’. However, as is often the case with in house dog to dog issues, this in itself can create an atmosphere and a ‘walking on egg shells’ feeling. This again is building anxiety and tension. Because of the issues with Tizer’s behaviour, his freedom and ‘outlet’ had been tapered, due to the restrictions his behaviour causes. A dog with ‘dog to dog’ issues, can be a life affecting responsibility. This could also contribute to his tension and eventual reactivity. The other factor is the genetic influence on Tizer’s behaviour. He is part herding breeding and I suspect, part gundog. Both these types of dogs, have a high level of prey drive which has been utilised for a ‘job’, if and when this isn’t allowed to have an outlet, this can also contribute to a behavioural issue. His owner stated that he often would nip at her other dogs heels, when they run which is a trait common in herding breeds. She said that because of his unpredictable nature, she had been reluctant to allow him to run with her other dogs, fearing the nip would escalate. You can see the picture being drawn and the ‘clues’ all merging together. Here you have a sensitive dog, with a level or anxiety in his make up, who has entered adolescence and started to alter the way he behaves. This has resulted in every increasing internal fights between dogs in the home, and caused a level of apprehension within the household and owner. His lack of confidence around other dogs, has then manifested itself into anxiety and defensiveness, and eventually aggression. He may have formed an unhealthy attachment to his owner, which would manifest itself in him resource guarding her, or her property, which could trigger an aggressive outburst. His behaviour has meant that his freedom and exercise are tapered, which could also create pent up frustration. Often, there is not one singular cause a behaviour issue such as reactivity and aggression. As you can see from Tizer’s case study, it is more an accumulation of several factors. So… now how to help him…. can I help him? Is his behavioural issues resolvable? I shall be doing a live stream where you can ask questions and receive answers…. for more details, check it out! Motown records to record breakers…. Just back from a weekend of teaching, and as always I feel so fortunate and privileged to have been asked. However this weekend was a bit unique. See the club I was asked to teach for, was Lichfield Dog Training Club. For those that don’t partake in competitive Obedience, you may not be aware of ‘who’ Lichfield club is…. so let me give you a little insight into why this was such a privilege. Quite simply put, Lichfield would be to dog training what Motown would be to music. A club steeped in history and accolade, they probably hold the British record for the number of Obedience Champions, Ticket winners, Crufts judges and Crufts winners, within the dog sport of competition obedience. Thats some résumé. I suspect the only club with a record to rival Lichfield would be the infamous South London DTC. If Lichfield was Motown, South London was Arista records. It was truly an honour to share the same space of so many greats, before me. You can tell I’m somewhat of an obedience anorak and make no apologies for that. I have trawled the internet, magazines and wider publications educating myself on the history of the sport. In doing so, I have a huge respect and understanding for those that came before me (the Lichfield patrons for example), but I also can see turning points in the sports history. Knowing the history of your sport is a worthwhile endeavour, as it is where the roots and foundation on which you now stand, are laid. It is a balance between looking back and moving forward, and knowing the path we’ve worn will tell us the route to take. Whilst teaching, I am often entertained and dined, and this was no exception. It was a chance to take a trip down memory lane and reminisce about years gone by, to break bread with people I wouldn’t usually have the chance to do so with. Having been involved in training dogs for nearly 30yrs, there was quite a lot to talk about! The conversation prompted this blog and many thoughts relating to the past and present. And in fact ‘our’ sport as a whole. I make no secret of being passionate about all things ‘dog’, and sports are top of that list, and specifically competitive Obedience. Its been a part of my life for more years then not. Obedience can get bad press, for being ‘boring’ or ‘serious’, but for those that partake in it, it the canine equivalent of dressage. I appreciate that it may be an acquired taste, however it is anything but boring when done well. The contrast between intricate precise movements and exuberance and energy, are what make the sport both challenging and appealing. I have partaken in it for all of my career and I still find the sight of seeing a ‘team’ working in total unison, a thing of absolute beauty and joy. Often dog related matters, certainly within sports, can cause a tribal mentality to methods, views and perspectives, diet, equipment and all that relates. This is not unique to dogs, but a trait of human nature. We only have to look to politics to see this in full glory. We draw lines in the sand, pistol at dawn, loaded and ready to be fires. To me it is an asset that we have diversity and a broad range of opinions. It makes it interesting and topical. However, the irony is that we have more in common then differences. This is the ultimate human story. We are far more alike than different. Our conversation was a group of people, who may differ on some views, but our commonality is that we all are deeply passionate about the ‘game’. We want to see it prosper, it has given us all more then we could ever quantify. The landscape of dog sports has greatly changed since many of us started, and the variety of activities available has had an adverse affect on obedience specifically. Obedience is a sport that requires a long term investment in contrast to other sports with more instant gratification. This reflects the world we live in now, where the changes in how we live mean that we are often conditioned to seek out instant solutions. The infrastructure of clubs and classes primarily oriented to competitive dog sports has largely altered, people attend classes on a short term basis to complete a course for 8wks, with a certificate at the end. In years gone by, you worked your way up the relevant classes, and the ‘top’ class was a goal to aspire to. You often had several key members who attended and contributed who were actively competing, which then influenced the classes, content and direction of methods. So the ‘bug’ was passed on. However this is largely a rarity now. You may have clubs and societies that have some competitive entity, but this is becoming more and more uncommon. Private trainers and groups serve this clientele. This has often been a aspect to apportion ‘blame’ to…. and there may be some truth in it. However seeking to place blame on a single factor will merely prevent us at looking at the greater picture. Another factor is nurturing the new blood, and making the sport accessible and attainable. The bottom line is that people want to have reinforcement. Just like our dogs, there has to be something in it for them. Having a competition based on qualifying vs winning, at the preliminary levels would encourage people to persist. Having a system where entry to shows was contingent on ‘giving’ back. Having an annual inter-club competition, where members had to be ‘active’ within the club itself, would feed into the registered club system, provide help and support for shows and events. Allow those that won a certain amount of ‘reserve’ championship certificates to qualify for our major championship would increase numbers and give supporters something to watch and a wider cross section of people, dogs and competitors. These are just some of the ideas, that all came about from breaking bread. There were at least another dozen more. However a large reason why the majority will never gain momentum, is the main contributing factor to the current issues we have. Politics, misunderstanding and misconceptions. These are the greatest adversary of the sport succeeding and prospering. We could substitute ‘obedience’, for any dog sport, or fishing or knitting, or kayaking or…. well you get the idea. We often second guess what our ‘opposition’ is thinking, yet we share more then which divides us. Put down your sword, baton and guns… stop and listen. Be willing to do that much. You don’t have to agree, but you might hear your similarities. And there in lies prosperity and growth.